A one-off special project made for a vintage 1919 Victor projector. There were some 2400 made between 1917 and 1922 in North America and they show a very rare gauge of film, 28mm. The 28mm gauge of film was introduced in 1912, but by 1922, had almost faded in to obscurity and that is why these particular projectors are so very sought after. There are around a dozen or so that have survived, worldwide, but most are in museums. There are four in original condition, in the hands of private collectors, which are still working, but this is the only one known of, which has been fully restored. 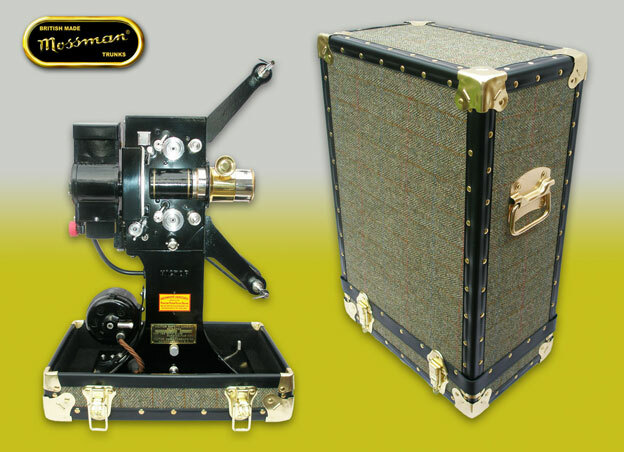 The Harris Tweed-covered Mossman Trunk style case suits the projector's era, not only looking great but also aids transportation to venues around the UK.